In No Kidding, comedy writer Henriette Mantel tackles the topic of actually not having kids. 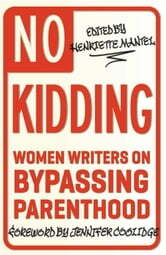 This fascinating collection features a star-studded group of contributors-including Margaret Cho, Wendy Liebman, Laurie Graff, and other accomplished, funny women-writing about why they opted out of motherhood. 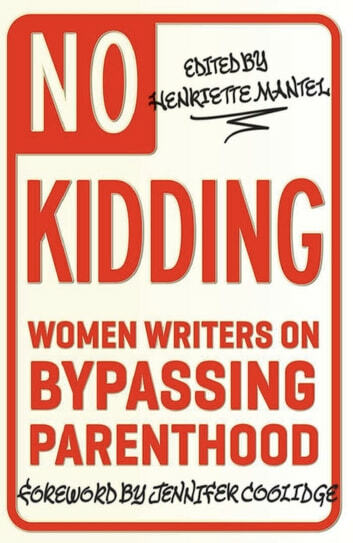 Whether their reasons have to do with courage, apathy, monetary considerations, health issues, or something else entirely, the essays featured in the pages of No Kidding honestly (and humorously) delve into the minds of women who have chosen what they would call a more sane path. Hilarious, compelling, and inspiring, No Kidding reveals a perspective that has too long been hidden, shamed, and silenced-and celebrates an entire population of women who have decided that kids are just not right for them. It's Not That I'm Bitter . . .
"If You Lean In, Will Men Just Look Down Your Blouse?"